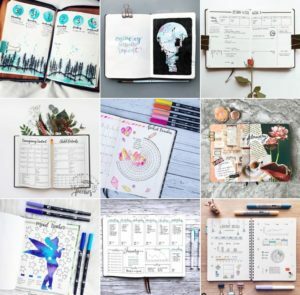 You’ve heard all about them in the Bullet Journal community. 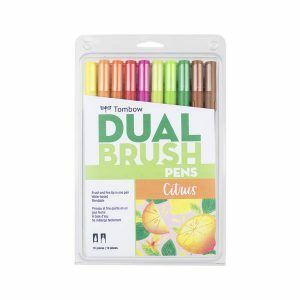 Available in 96 colours with flexible brush tip and fine tip in one marker, the Tombow Dual Brush tips are proving to have so many uses, people just can’t get enough of them. 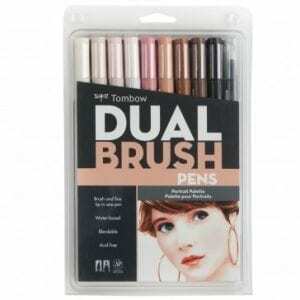 I personally bought a couple from a recent visit to the USA and was blown away by the pigments in the colour. No pastel pens had offered such mild but beautiful tones, or brights with such depth. Naturally, I had to figure out offering them to our NZ and Aussie Journal Junkies. 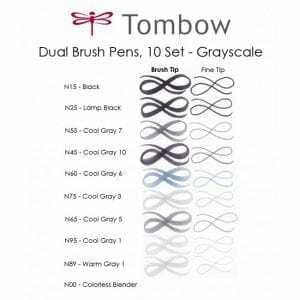 The brush tip works like a paintbrush to create fine, medium or bold strokes – perfect for colouring in; the fine tip gives consistent lines. 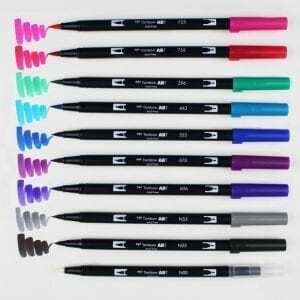 The water-based ink is non-toxic, acid-free, and odorless. The colourless blender softens and blends colours, creating a watercolour effect. 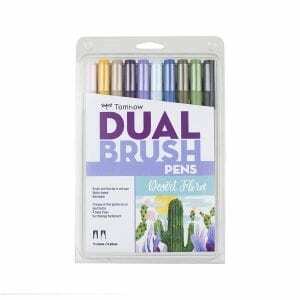 Ideal for fine artists and crafters, and perfect for rubber stamps! 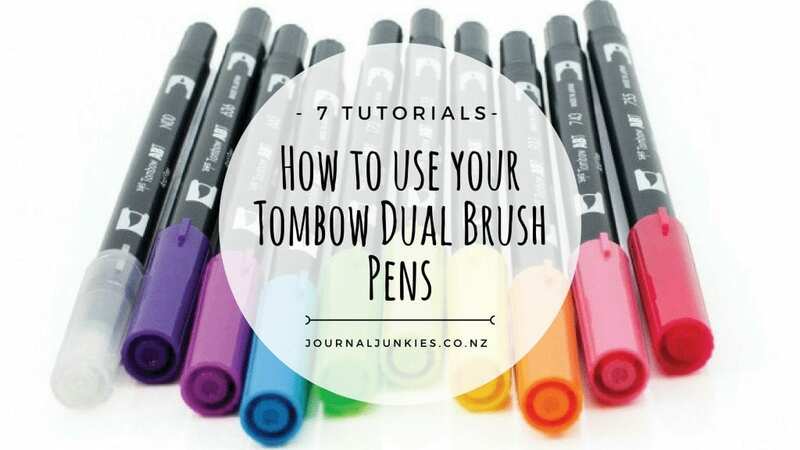 So I started doing my research and wanted to round up all the best uses for these amazing pens – and include tutorial videos so you could try some techniques yourself! 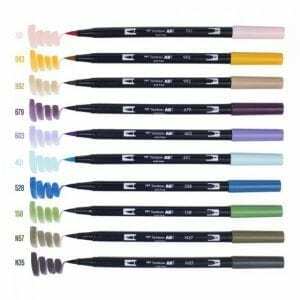 Okay, so it may seem silly to start with “use them to colour in”, but if you’ve never used a good brush-tip before, you might not realise how the tip moves under your hand! (I didn’t really “get it” until I tried it, and I was very impressed). The fact that the thickness of your line depends entirely on how hard and at what angle you colour at, means that you can go from shading in big spaces and get right up into tiny nooks and crannies, all in the same brush stroke. It really allows you to be really accurate with where you’re colouring, so you can always colour within the lines (or deliberately outside them, if that’s your thing). Because the ink is waterbased, unless you really pile the colour on (which you don’t need to because the pigments are awesome), you get hardly any ghosting and no bleeding, even in the Leuchtturm1917! 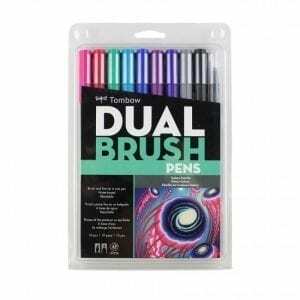 The video above is BohoBerry’s review of the new Galaxy and Pastel packs – mainly because there were no videos of simply colouring in the lines (surprise, surprise). 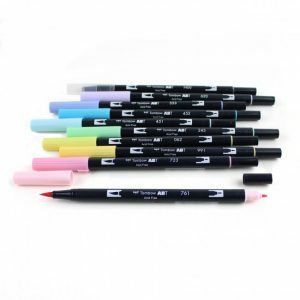 Each pack of ten Dual Brush Pens comes with a colourless blender, which you’ll soon learn has so many different uses! 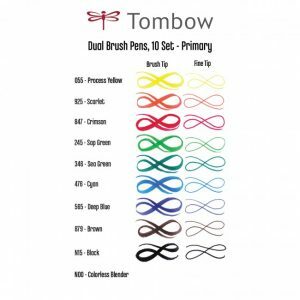 One watercolour blending technique is to colour the darkest area with your Tombow, then use a wet paintbrush, or the blender, to blend the colour out. You can create these gorgeous ombre watercolour effects with very little ink and a bit of practice! Let us know how you get on! 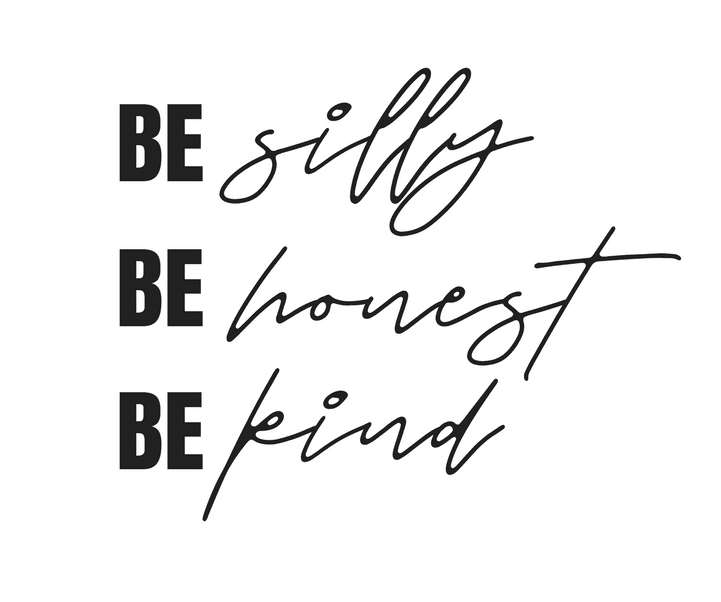 So this one is really all in the name – while you can absolutely fake calligraphy (by just colouring in downstrokes with thicker lines), you can also learn how to write with brush lettering, using – you guessed it – a brush pen! 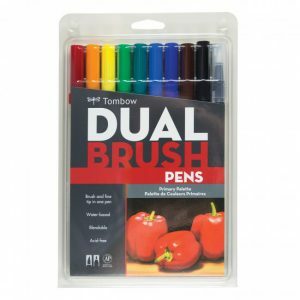 While the Tombow is just fantastic quality, it’s not a bad idea to practice with a less-expensive brush pen, just until you are happy with your technique! 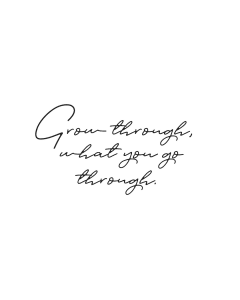 One of the surprising things about brush lettering is it’s not the same writing style you learned in school – it’s okay and even encouraged to take your pen off the paper for different strokes! The above video takes you through the alphabet. Remember that no one becomes great at this stuff overnight, it takes practice, so don’t be too hard on yourself if your first attempts don’t look so flash! 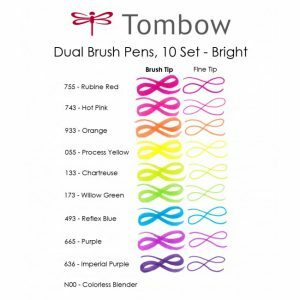 One of the most remarkable things about the Tombow Dual Brush Pens is the ability to blend colours straight from the brush tip! And for hand lettering, they can create some awesome effects! 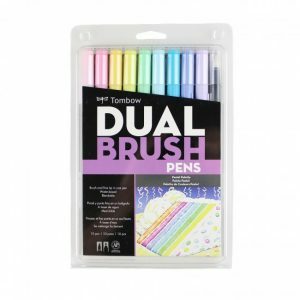 Each 10-pack of the Tombows comes with a plastic blending palette, but you can just as easily use some laminated cardstock, a plastic paint palette or even just a ziplock bag! Experiment with how much colour you pick up with your brush pens, and which colours blend into others smoothly (dark into light tends to be a little easier!) This is one of our favourite techniques! Show us how you get on on our Facebook page or tag us in your work on Instagram! 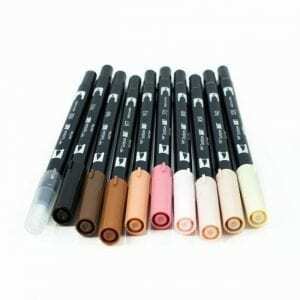 Another way to get blended colour, is to put the two colours on top or near each other on paper, and then use the colourless blending pen to literally blend the colours together. Sounds and looks really simple, but getting the right amount of ink in the feathery motion can be quite tricky so, again, worth practicing! 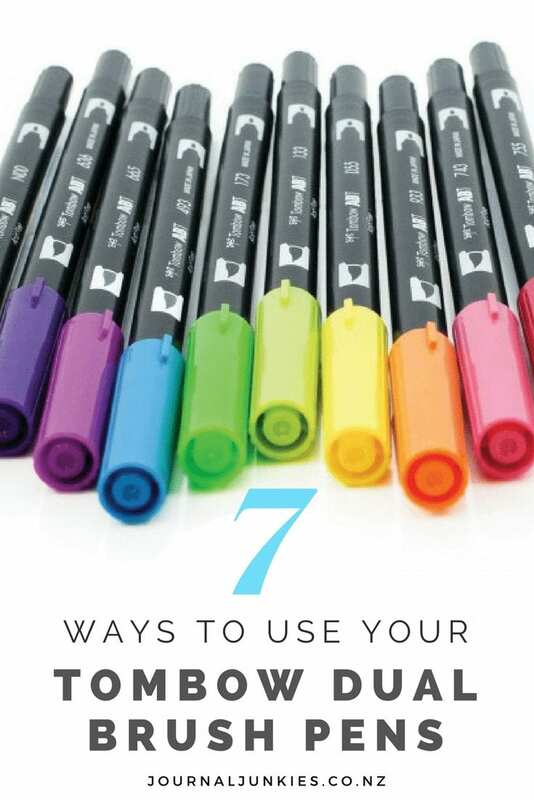 Please note: we recommend you don’t use this technique directly in your journals, as the paper is likely not thick enough to take all the extra moisture and starts to disintegrate under your pen. Get some watercolour paper instead, and stick it in! I’ve included two videos in this because I just couldn’t pick which one I preferred, but they both use the same technique. 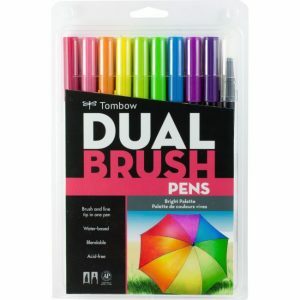 Not going to lie, we totally love these butterflies, but the video shows such a different way of using the Tombow Dual Brush Pen ink in your projects! 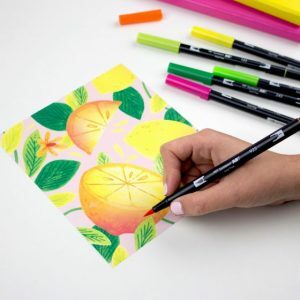 Paint a little ink onto the plastic or cardstock (a palette comes with each 10-pack), pick some up with the colourless blender and paint like you would with a paintbrush! We’re sure you could create so many effects with this – we’d love to see! Tag @journal_junkies on your Instagram pics!! Have you seen those gorgeous watercolour effects and thought you needed special tools or skills to recreate them? 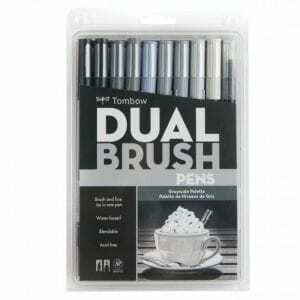 Luckily, you have everything you need when you buy a 10-pack of Tombow Dual Brush Pens. Even the packaging comes in handy! But don’t worry, you can use any plastic surface, such as a ziplock bag, to create the same effect! Are there any techniques I’ve missed? Let me know in the comments or contact me! This entry was posted in #BuJo Tips and Tricks and tagged brush lettering, brush pens, colouring, hand lettering, tombow.